Sonitor’s infrastructure is comprised of Gateways and Location Transmitters and uses the facility's Wi-Fi system for communication of RTLS data from tags, badges and smart devices to the server. If the facility does not have a Wi-Fi network, or if it does not provide adequate coverage in certain areas, Sonitor can easily deploy a Wi-Fi communication function as an integral part of its RTLS network infrastructure using Sonitor Gateways. Quad-LTs (location transmitters) are the devices used in our Sense™ RTLS platform. 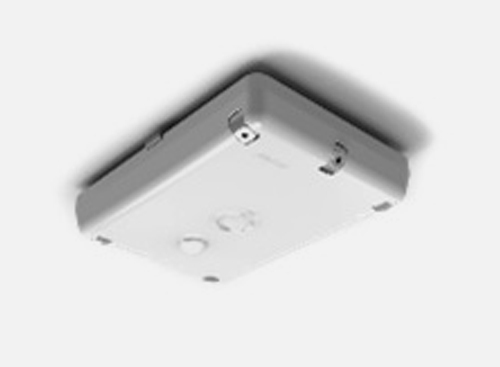 They are wireless (power over Ethernet (PoE) optional), multi-function, battery-operated (4 standard D cell 1.5V standard batteries) devices that are mounted on ceilings (via simple clips) or walls and are assigned unique identifications (IDs). These LTs transmit ultrasound signals that are synchronized by gateways and are then picked up by tags/badges that also have a unique ID. When the tags/badges receive the location information from the LTs, they communicate that location via Wi-Fi to a server, providing the exact location of that tag at the exact moment the signal is received. Ultrasound LTs can combine both ultrasound and low frequency transmitters in a single unit and enhance positioning accuracy as well as the update rate of the SmartTags and SmartBadges that receive the ultrasound signal. Sonitor Sense Location Transmitters can be used to create defined zones. A single LT supports up to 4 RTLS zones and is typically deployed to create virtual, ultrasonic walls, accurately dividing the room or creating chokepoints using the ultrasound channels, low frequency (LF) radio or a combination of both. LF chokepoints are Cisco CCX compatible and can for example be used to divide floors and areas with high accuracy and reliability. Through a combination of Sonitor Sense LTs, a virtually unlimited number of zones, of any size, can be created in rooms and larger areas. The gateways synchronize the LTs via an 802.15.4 radio which provides remote configuration and monitoring. This synchronization allows multiple LTs to be mounted within hearing range of the tags or badges and ensures that they communicate their exact location in advanced deployments requiring very precise positioning such as bay, bed or chair level resolution. Gateways can also be equipped with Wi-Fi capability to provide a redundant communication path to a facility’s access points. This can be beneficial in critical areas such as psychiatric units or emergency departments. The Parallex™ is a single device that delivers the combined functionality of an LT and Gateway (Wi-Fi) into a single device. As a result, this could reduce overall infrastructure requirements up to 30%. In addition, Power over Ethernet (PoE) device can create up to 4 zones. The Sense gateway backbone network is actively monitored, and communication with the LT is dynamically routed through any available gateway, guaranteeing high availability of the infrastructure at any time. ultraBeacons are the devices used in our Forkbeard platform. The ultraBeacon is a small (approximately the size of an AppleTV), battery operated (4 AA cell batteries) location transmitter with BLE and ultrasound technology. Based on its unique design, its power consumption is minimal and the batteries will easily last 5 years. Sonitor’s Sense platform, powered by SmartZoning™ technology, uses ultrasound as its core positioning technology and delivers the most accurate and reliable indoor positioning data available on the market for room, bay, and chair level tracking and location accuracy and for creating chokepoints. SmartZoning technology leverages both state-of-the-art Sense QuadLT™ and SmartTags™. Sense QuadLTs deliver the ability to frame discrete areas, creating virtual walls on demand, easily and reliably delivering high definition zones within an existing space and/or create chokepoints for access monitoring. In addition, they are easy to install, unobtrusive, flexible, and scalable providing the ability to accommodate changing and growing environments and use cases. The SmartTags are embedded with the logic to know their location and to communicate instantaneously over your Wi-Fi network when their position changes. In addition to true, real-time location status, the tags also provide the contextual information that customers have come to rely on from Sonitor, so that they can gain critical insights necessary to take action. Sonitor’s SmartZoning technology gives you the accuracy and reliability you need to confidently do more with less.